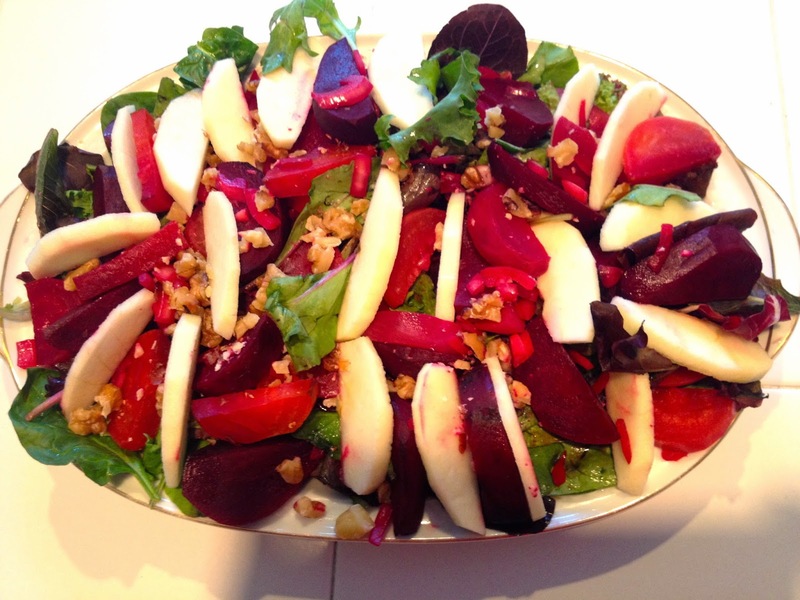 A perfect colorfully tasteful fall salad that will not only taste wonderful but look gorgeous. Beets are just such a good healthy addition to any meal. I make a lot of beet dishes cause they are just so good especially freshly roasted as I prepared them for this fall salad. 1 lb red or yellow beets peeled and cut into quarters. You can use half red and half yellow. In a medium size roasting pan sprayed with cooking oil place beet and roast at 400F for 30 minutes turning once. Remove from over and sprinkle with vinegar. Cool and refrigerate for 4 hours or over night. Place sliced red onions in bowl and cover with 1 tablespoon vinegar for 30 minutes then drain. Arrange arugula, kale, apples, onions on plate, top with walnuts. With a wire whisk combine oil, vinegar, salt, pepper and mustard to make dressing. Serve with salad dressing on the side.